Hot or not? You be the judge. Fashion blog Refinery29 tackles the do's and don't for guys in glitter. First, it was MC Hammer pants, now the ides of fashion seem to have even more dastardly tricks up their sleeve. This time, the gals over at Refinery 29 highlight a growing trend in menswear: sequins. That's right, Goldfinger-style, Vegas-inspired, Elvis-lovin' glitter. In a post that asks the question, "Rad or Bad?" 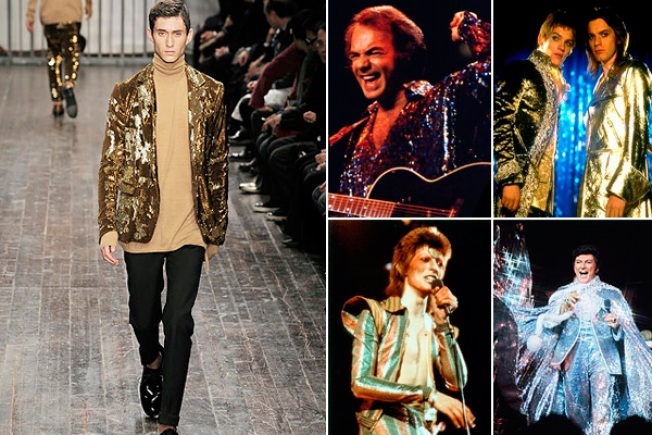 the indie fashion site highlights a particularly sparkly gold jacket on the runway at Alessandro Dell'Aqua, cleverly pairing it with other slightly egregious glitter-plenty mishaps: Here a Neil Diamond portrait, there a Ziggy Stardust picture ... oh, and did we mention Liberace? Love of God, let us not forget Liberace. Bizarrely, Style.com reported that Dell'Acqua's "new catchphrase is 'bourgeois revolution.'" The article goes on to report that the designer believes the struggling middle class is in the middle of a "sensibility shift"—a statement that make sense, for sure (I mean, even in Paris, people are reconsidering the definition of luxury) ... but does that "shift" seriously involve gold jackets? The Milan fashion shows took the trend in a decidedly different trend: The New York Times reported that those shows looked more like a funeral in black than an Elvis-in-Vegas show. Bottom line: We're as confused as you are, world. Which would you all rather have right now: Gold jackets or a black suit?